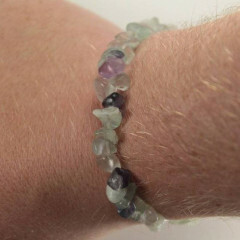 Fluorite is an interesting mineral that usually occurs in green or purple colours, and is frequently found with the colours banded together. It is a crystallised mineral usually characterised by its cubic crystals. It is usually sold polished, but rough does look nice too. 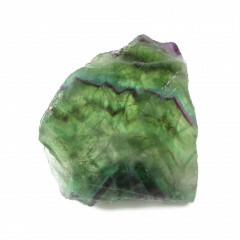 Polished stones tend to take light better, though – this stone looks truly amazing held up to a light source. Pieces are found in a wide range of colours and has consequently been dubbed “the most colourful mineral in the world”. It can also exhibit fluorescent qualities when exposed to UV light, depending on the location it was found in. It is found worldwide, in many places, but the largest deposits are in South Africa, Mexico, and China. It is one of the few gemstones mined in the UK – it is known as ‘Derbyshire Blue John’, coloured in seams of yellow and purple. The mines only produce a very small amount per year, though, and the mineral is quite expensive. It is mined in two locations, both in the town of Castleton. 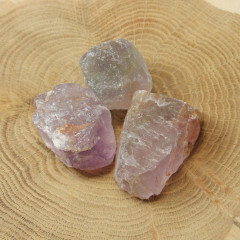 Tours are available, for those who are interested in seeing an actual gemstone mine. 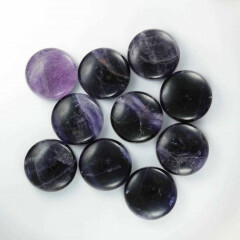 It is meant to encourage spiritual and psychic unity as well as protection and peace of mind. It aids meditation and can help cancel out the “noise” and mental interruptions we face when first learning to meditate. 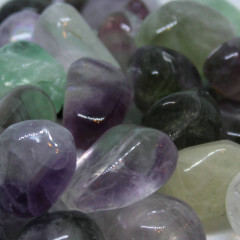 It is considered particularly helpful to those born under Capricorn and is associated with the High Heart chakra. Images – Rough, Carved, and Cut and Polished. Partly polished specimen, showing a good range of banding and colours. An interesting carving, carved by Romans in around 100AD – it is known as the ‘Crawford Cup’. More information can be found at the British Museum website. A more modern carving of a pig, showing off the lovely green and purple banding of the stone.